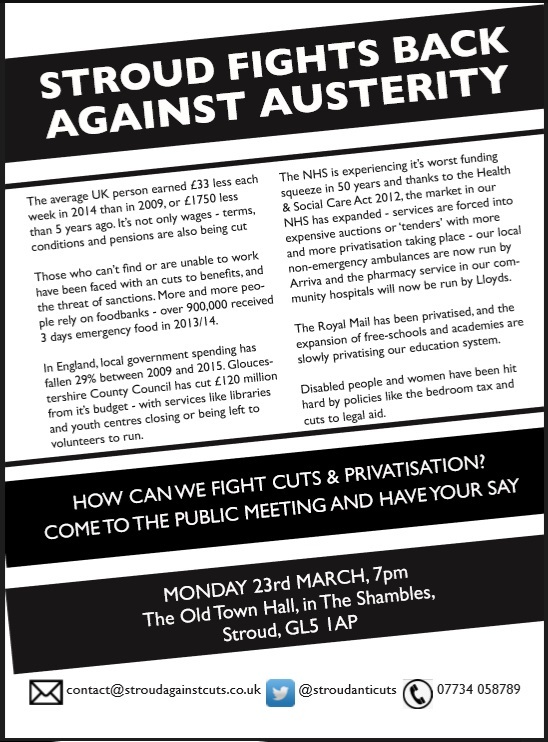 Our next public meeting is again at The Old Town Hall in the Shambles, Stroud (GL5 1AP). We will be looking at the effects of Austerity in the UK and discussing "How we can fight cuts and privatisation", all in the context of the forthcoming General Election. All are welcome, and entrance is free, with a collection to cover costs. Candidates from local political parties will be present to debate in a question time style event. Haydn Jones, Conservative Stroud District Councillor for the Severn ward.